This series will take you through the step-by-step process of teaching your horse to do four basic tricks: Lay Down, One-Legged Bow, Two-Legged Bow, and Sit Up. It starts with several prerequisite exercises that your horse will need to know before starting tricks, such as Sidepassing Toward You and Ground Tying. The series then takes you through the training of two different horses, Foster and Kit, as each of them make different mistakes and learn at a different pace. The horses’ training was filmed on a weekly basis to show you their progress and how to introduce new concepts. It’s like watching a training diary! Throughout the series, Clinton covers the 8 Steps to Success for each trick, just as he does with every exercise in the Method. Each trick includes a Refinement portion, where you can learn to make the trick fancier and more impressive. You’ll learn how to fix problems you may encounter, and you’ll pick up valuable information such as how to know when the horse is ready to move on to the next step. 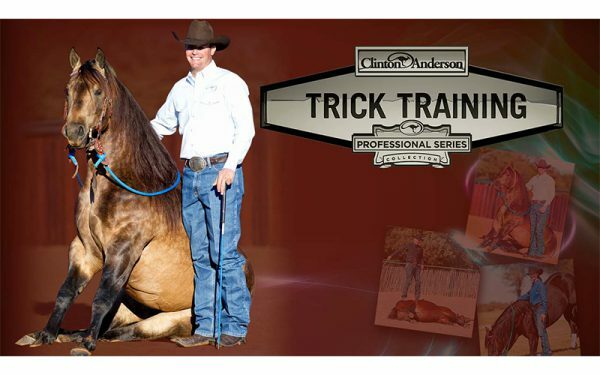 The digital Trick Training Series may be accessed on your mobile device using the Downunder Horsemanship app, which is a free download from the App Store and Google Play, and on your computer through the Downunder Horsemanship website. Please note: This series is intended for horses that have been through the Fundamentals level of the Method as well as the exercises on Clinton’s Hobbling and Leg Restraints video series.